240v ring main from shore power , 24v dc to 240v ac 2000 inverter from service batteries. They also have included a range of tools for general and marine use. Echopilot FLS2D forward looking sonar. Cobra portable floating VHF radio. Chart locker containing many southern UK & Channel charts. Full set of plotting instruments. This Broom Continental 37 is now ashore awaiting a new owner . The current owners modified and customised the boat to comply with — and exceed— licensing requirements for commercial use. The boat is fitted with an up–to–date suite of modern navigation aids, providing a high standard of safety and comfort. She has been coded as a Small Commercial Vessel to MCA Class 3. She has been used not only as a seasonal home but for their business: running nature tours . The owners made extensive modifications to her, to comply with — and exceed — commercial licensing requirements and safety regulations. These modifications, far from limiting the vessel’s use purely as a pleasure boat, in fact enhance the boat’s safety and security. Whether for commercial or personal use. The boat is coded as an SCV Class 3 vessel and is licensed for 12 passengers. As a pleasure craft, the Broom 37 Continental is ideal, with a raised open aft deck with uninterrupted, panoramic views; comfortable seating and extra–large windows in the saloon; and twin conning stations (saloon & flybridge), to accommodate changing weather conditions. With bunks in the forward cabin and aft cabin, and pull–out bunks in the saloon, she can easily sleep six people. The two heads (the aft head, a sea toilet; the forward head a vacuum toilet) are especially convenient when guests are staying. Having been designed for coastal cruising, she was originally fitted out with comprehensive instrumentation and navigational equipment. In converting her to a commercially–coded vessel, she was fitted with an even more extensive range of equipment. Over the years, they have replaced and added to the existing equipment to maintain operational and safety standards. In addition, the boat is suitable for living aboard. The aft cabin is spacious, with plenty of storage space. The galley hosts a range of facilities and cookware. The interior has been decorated to feel more like a home than a day–tripping boat — bright, warm and stylish. Modifications to the electrical system, with more powerful batteries, ensure life aboard is anything but spartan! 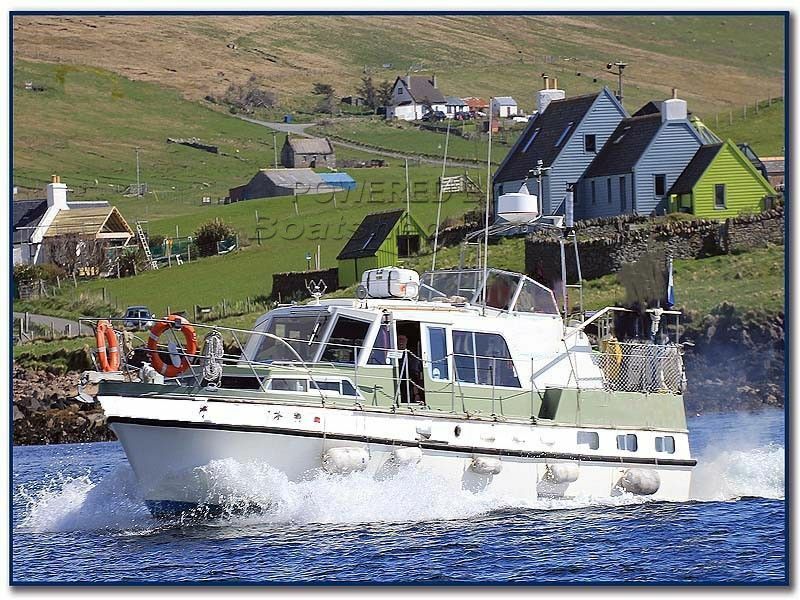 This Broom 37 Continental has been personally photographed and viewed by Ian Sawkins of Boatshed Scotland. Click here for contact details. As she is a class 3 small commercial vessel I am presuming she is surveyed and class certificated. Could you tel me when the last survey was and when she was certificated please.